With so many design and function elements involved in bathroom design, remodeling can be intimidating. One wrong design choice can make your bathroom plans go completely awry. Don’t let that stop you, however. You don’t have to be an interior design professional to plan the perfect bathroom remodel. When you consider the relationships between color, shape, and function as it applies to your bathroom, you can achieve a bathroom that satisfies both aesthetic and practical needs. Here are some bathroom ideas that will help you coordinate the perfect bathroom for your lifestyle. The bathroom furniture you choose, such as cabinets or a bathroom vanity and sink combo, is one of the major considerations in a remodel or new build. These items perform both as a major functional piece and as a stylish focal point. To choose furniture that is suitable for you and your family, you must consider the amount of storage you need and the options for a bathroom sink cabinet that are available in your particular style. This means that you may have to make a reconciliation between form and function. If you are going for a minimalist look but need loads of storage for several persons, it may be better to gravitate toward versatile transitional pieces of furniture like the one above, in order to obtain ample storage yet still visually coordinate with an overall streamlined minimalism. Elements of color and texture can be manipulated to create the exact feel you want in your bathroom. You might prefer the coziness of wood wall colorings and ceramic tile floors to support a cozy and rustic look, or perhaps marble to give a classic and high-end look to a transitional bathroom. While the mood of a bathroom can be transformed with a can of paint in a day, it pays to plan out how your chosen flooring and wall treatments will work together to create the look you want. Will you want a tile surround for your tub, and if so, do you want the color to pop, or remain neutral? Do you want nature-inspired textures, or sleek lines with smooth surfaces everywhere? Consider the bathroom’s purpose when deciding on a color scheme. While a half-bath powder room can be great in a punchy and dynamic color, a master bath suite would not be as relaxing of an oasis if it was painted in bright purple or fuschia tones. One of the best bathroom ideas for a bathroom with neutral floors and walls is to infuse a pop of color with the functional elements of the room such as furniture and hardware. There are bathroom vanities with sinks available like the one above that can serve as the focal color accent for the room. While creating a luxe vibe, the flooring and wall treatment support (rather than compete with) the focal point of navy blue and brass. The overall mood remains calm and sophisticated. If your style has a specific color palette such as the Swedish style, it makes sense to play out the theme with your walls, floors, and furniture. 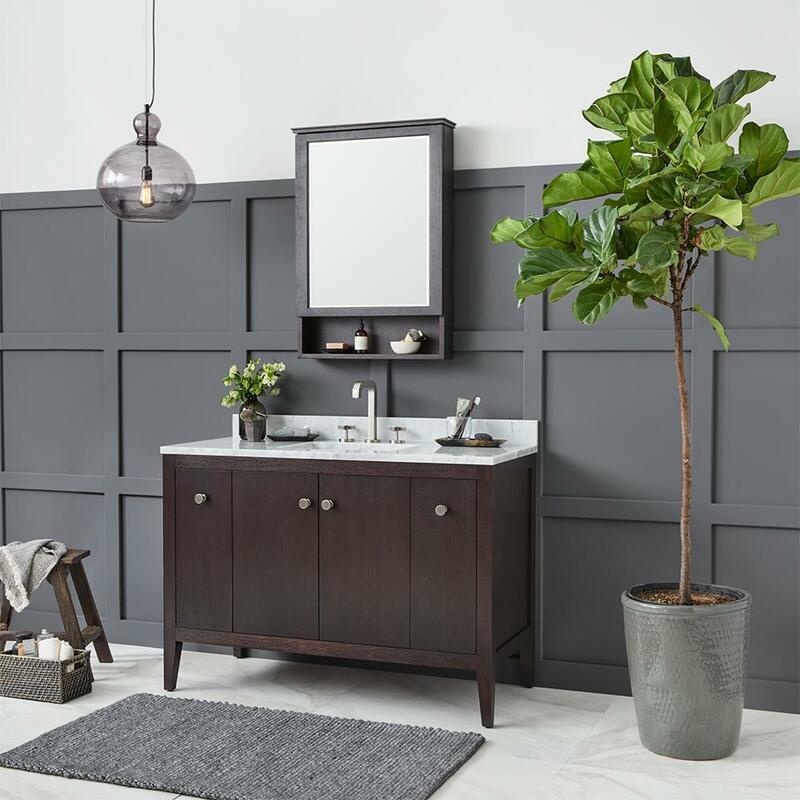 In the example below, a crisp transitional white bathroom vanity cabinet and sink with a subtle brushed nickel faucet and knobs pairs well with the vanity’s accent colors of gray. Another major decision is the choice of one or more materials for the working hard surfaces such as the sink, countertop, shower, bathtub, and bathtub surround areas. As you decide on materials, consider the wear and tear the bathroom will receive, how much time you have to maintain it, and your budget. One type of bathroom sink to consider is a sinktop, which combines the sink and countertop into a single, functional piece, typically in vitreous china. Other notable choices are undermount bathroom sinks and bathroom sinks above the counter, known as above counter sinks or vessel sinks. There are design realities to consider with each of these sink types. 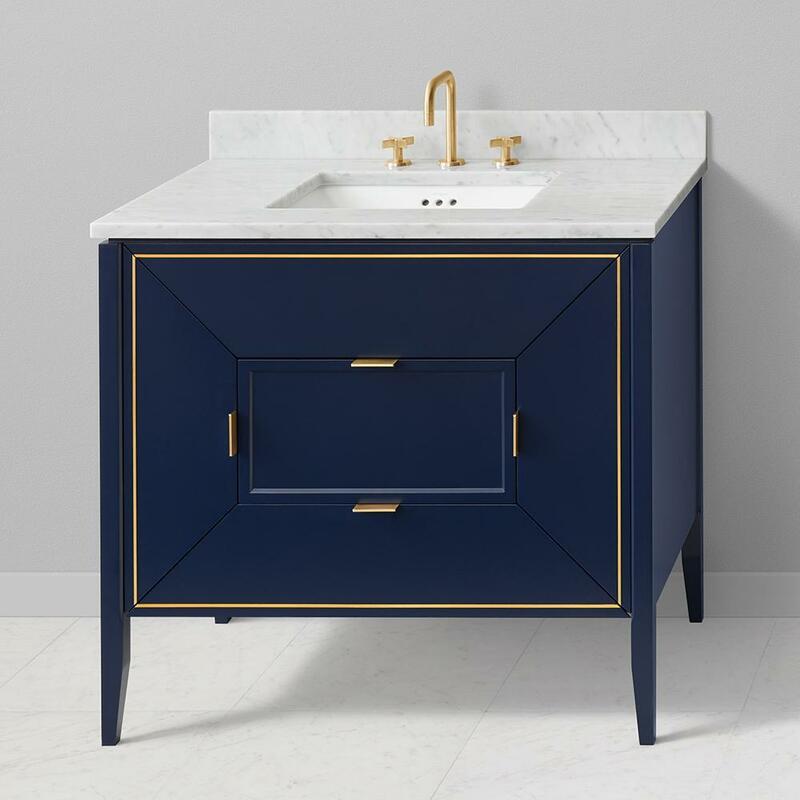 Sinktops, which integrate both sink and countertop, are relatively easy to install as they simply need to match the dimensions of your vanity cabinet. They rest atop the entire vanity and only need to be sealed in place. Above counter sinks are less expensive to install because the lip around the sink rests on the countertop while the basin is recessed into the vanity, allowing a bit more undercounter storage space than an undermount sink. Note that the lip, however, may need to be re-caulked and cleaned on occasion for maintenance. Common where granite, recycled glass, or hard composite countertops are involved, undermount sinks are easy to integrate design-wise, but require cleaning beneath the portion of the countertop that overlaps the sink. Undermount bathroom sinks cost more to install because the fitting process is more intensive and precise, and specialized supports need to be built. Homeowners with children will want to consider vitreous china sinks for their superior wearability and ease of cleaning. Stainless steel is another durable choice. Tempered glass vessels are distinctive and artistic but can have stability and height concerns for some households, especially for those with young children. Decorative ceramic sinks can be customized and can be very style-forward, but are generally not as resistant to chipping. In the overall scheme of your bathroom, will both the shower and bath area be combined, or separate? Perhaps you are planning a bathroom with a combined shower and bathtub. A low-cost refresh option is a tub and shower combo insert, or a stand-alone shower insert. Many tiled options can be accessible with some tile installation know-how. For a more high-end aesthetic, consider separate shower and bathtub looks. Freestanding tubs come in classic claw foot as well as more minimalist, contemporary designs. Marble and stone are other materials that can also be integrated into countertop and bathing spaces. It may seem like a minor detail, but your bathroom’s fixtures and hardware not only need to coordinate with each other, but must also support the overall style of your bathroom. Brushed and oiled metal fixtures look great with a rustic look, while the glitz of bronze adds a touch of shine to a deluxe contemporary bathroom. Before you decide on hardware for your bathroom sinks and vanities, make sure you like the weight and feel of them as much as you like their look, as you will use them daily. An additional consideration for bathroom fixtures is extra features. Do you want a straightforward shower head or one with a wand and several settings? For your sink fixtures, do you prefer single lever handles, dual handles, or a centerset? The possibilities are endless. Mirrors over bathroom sinks are a necessity, but has the potential to be a statement piece that unifies the entire room. Do you want your mirror to take a starring role or support role? While you need at least one mirror over the sink for practicality, accent mirrors around the room can lend a feeling of expansiveness, especially in a small bathroom space. 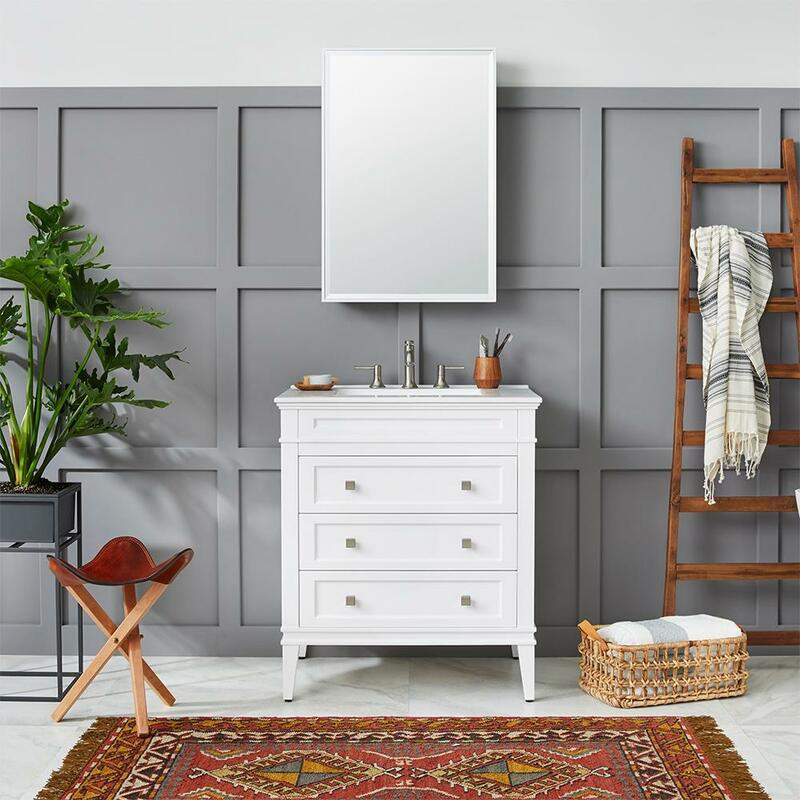 With a multitude of mirror choices available in all sorts of shapes, sizes, and styles, you’ll have no trouble pairing your mirrors with the rest of your bathroom. 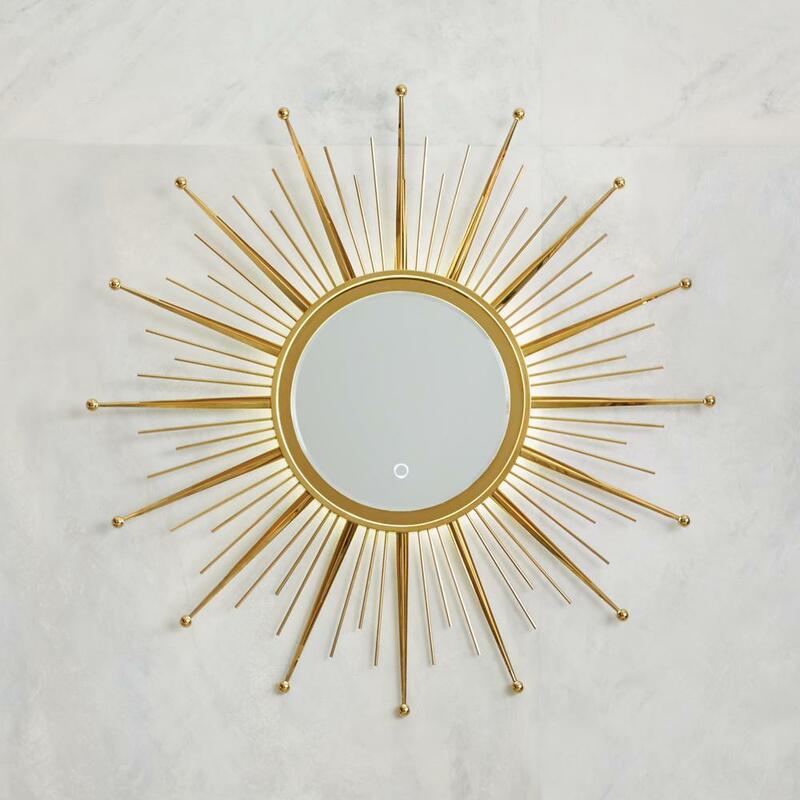 A unique mirror like the Amora Sunburst mirror above provides the perfect focal point for a variety of bathroom designs, from mid-century modern to glamorous shabby chic. Great lighting is irrefutably a necessity for over the bathroom sink, but its role in illuminating the whole bathroom must be considered as well so that you and your new bathroom look its best. At a minimum, you will need a primary light source over the mirror as well as accent lights such as sconces on either side of the sink countertop. While the main light will illuminate you when you shave or put makeup on, the side accent lights will make sure that you do not have any shadowy areas on your face. Necessity aside, the style of light fixtures you choose can go a long way towards defining the overall look of your bathroom. If you have the ability to access natural light in your bathroom, use it to add a natural softness by installing shutters on the windows in order to filter the light. Installing mirrors opposite the windows can also aid in magnifying the brightness of the natural light that comes in through the window. A small vintage-inspired chandelier adds sparkle and charm to a traditional bathroom. For safety’s sake, be sure that both tub and shower areas have proper illumination to avoid accidents. When considering any type of light fixture for your bathroom, make sure that it can hold up well to the heat and humidity of the bathroom environment. The utilization of bathroom accessories such as various soft containers to hold towels or other essentials can go a long way to make or break a design theme. For a farmhouse style, coordinating baskets made of natural materials add an organic feel to the room, while rigid fabric storage cubes supplement the clean, minimalist vibe of a contemporary bathroom. Even towels can serve as accessories to support the color scheme of a room. There are no absolute rights or wrongs in styling one of the hardest working rooms of your home. Instead of thinking of your new bathroom plans as a puzzle, consider it as a collage that you rearrange until its style and structure pleases you. 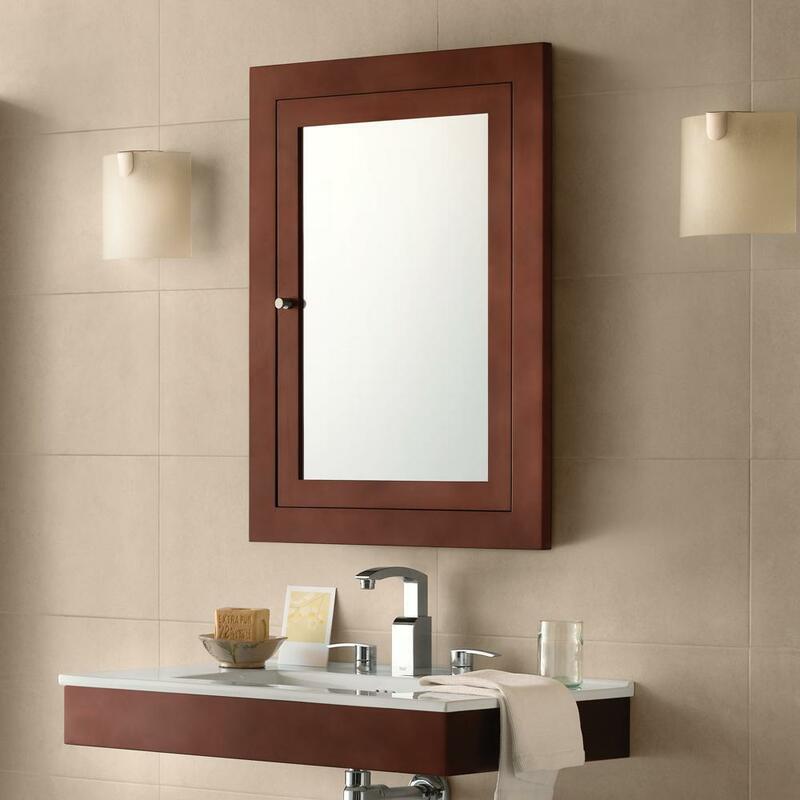 Look to Ronbow catalogs for a plethora of great vanities, hardware, mirrors, and cabinets to transform your bathroom. All of the elements of bathroom planning mentioned above can come together with your bathroom ideas as a unified whole given a little time and consideration.